In our article about how mobile technology impacts the construction industry, we examined the reasons why companies are equipping their technicians with mobile service tools to help them stay productive and efficient in the field. With so many workers now carrying mobile phones and tablets to the job site, it makes sense to equip them with cloud-based software that allows them to check on work orders, get up-to-date schedules, access project documents, enter real-time service details, and many other features that keep projects moving. That’s why we wanted to take a closer look at Sage Service Operations. What is Sage Service Operations? Working hand-in-hand with the information and details in your Sage 100 Contractor or Sage 300 Construction and Real Estate accounting software, Sage Service Operations is a web-based app that delivers information like work order details, invoice status, a dispatch board, employee assignments, job status, and much more straight to any web browser, mobile device, or tablet. It enables technicians to complete their work in less time and make fewer trips by providing the real-time information they need in the field. Improve communication between office staff and field technicians by capturing details like time, materials used, notes, and work order status in real time. Enhance customer service by giving your clients the ability to take control of their account information and submit service requests anytime, anywhere. Reduce paperwork and administrative overhead by eliminating duplicate data entry or errors caused by misreading technician notes. 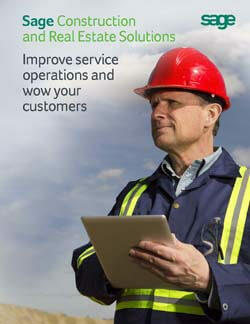 Effectively manage service operations and reduce the time to invoice. There was a time when the old pen-and-paper method of reporting from the field was all you had. But with a mobile device in just about every pocket today, forward-thinking construction companies and contractors are leveraging mobile technology for better efficiency and service. Equipping your workers with “mobile service” tools helps them stay productive and efficient in the field while keeping your business healthy and profitable. Leave your name below and we’ll send you a copy of this free eBook that provides information about improving your service management workflow. This document takes a deeper dive into the challenges of running an efficient service operation and how technology can help streamline service calls, cut costs, and drive more business.